பொருளாதாரத்தை பெரிதும் பொருட்படுத்துவதால் தன்னுடைய அதிபர் தேர்தல் பிரச்சாரத்திற்கு இடைக்கால ஓய்வு அளிக்க விரும்புவதாக ஜான் மெக்கெயின் தெரிவித்திருக்கிறார். இதனால் இந்த வெள்ளி (செப். 26) அன்று நடக்கவிருந்த ஒபாமாவுடன் ஆன வாக்குவாதத்தையும் ஒத்தி வைக்க பராக்கின் ஒத்துழைப்பைக் கோரியுள்ளார். McCain is a confused man. He delayed the opening of the GOP convention citing hurricane Ike and promised to go to hurricane hit area. Obama said he was going to watch but will not visit the hurricane hit areas as it would be a distraction for the relief efforts. Barely a week ago, McCain declared that the fundamentals of the economy are sound but now he wants to delay the debate to focus on the economic crisis. Obama wants to stick to the schedule and suggests it is more important to have the debate than ever. Today, McCain wants the vice presidential debate delayed. 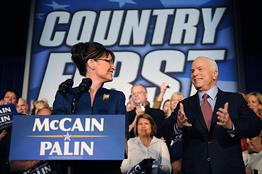 Having arranged for Palin’s foriegn policy training with Pakistan president Zardari, perhaps, McCain now wants to take Palin to Washingto DC for a training session on economy. By each passing day it is becoming clear who is behaving like a statesman and who is behaving like a politician, a dumb one at that.